• Great for testing VDRs, TVSs and other types of voltage protection devices. • Selectable test currents: 2mA, 5mA, 10mA and 15mA. • Tiny duty cycle of test current to minimise heating of your component even when testing at 50V and 15mA. • Measures breakdown voltage (0.00V to 50.00V) with a resolution as fine as 20mV. • Measures slope resistance (up to 1kΩ at 15mA with a 1Ω resolution). • Single Alkaline AAA battery (included). • Long battery life and regulated test conditions even when the battery voltage is as low as 1.0V. • Test voltages are below levels described in the Low Voltage Directive 2006/95/EC. • Continuous measurement display (updated 3 times per second). • Measurement "hold" function to hold displayed values even if component is removed. • Fitted gold plated crocodile (alligator) clips. • Very comprehensive printed user guide. • Comprehensive printed user guide. • Fitted premium gold plated croc clips. If you take great care with connection polarity*, you can test LED strings from just a few volts all the way up to 50V. In this example shown here, a string of 16 Luxeons (Lumileds) are wired in series to make a 44V string. 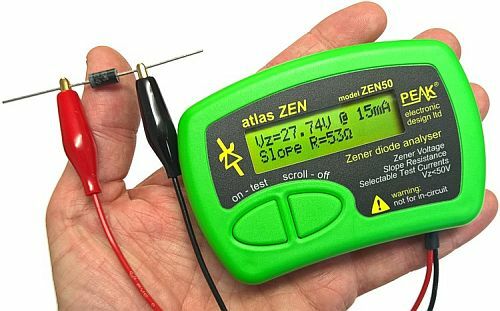 The Atlas ZEN will happily test the string of LEDs at the selected test current and display both the forward voltage and the slope resistance. Note however that the current is applied in very narrow pulses, so your LEDs won't be illuminated as brightly as you would obtain for a constant current of the same magnitude. Please note: If you connect your LEDs the wrong way round, the voltage generated by the ZEN50 will almost certainly kill your LEDs, you have been warned. 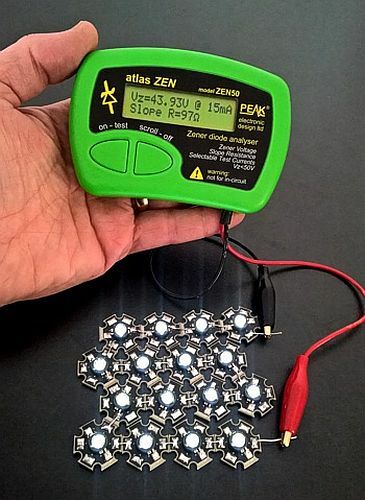 If you are not 100% confident about the connection polarity, do not use the ZEN50 to test your LEDs. A fresh approach to component analysis has resulted in the fantastic Peak Atlas DCA, an intelligent, slim and invaluable tool. A world of detailed component data has never been so accessible. Just connect your component any way round and press the test button. The Atlas DCA will then present you with detailed component information in concise, easy to read, scrollable pages. The displayed information will include: the component type, special component features, component pinout, and measured parameters (such as gain, leakage current, gate threshold voltages, volt drops etc...). No more searching through data books and catalogues in order to identify components and pinouts, the Atlas does it all. It doesn't matter how you connect the test clips to the component, the Atlas can analyse a vast number of different component types including bipolar transistors, enhancement mode MOSFETs, depletion mode MOSFETs, Junction FETs, low power thyristors and triacs (less than 5mA trigger and hold), diodes, multiple diode networks, LEDs, bi-colour and tri-colour LEDs. It will even identify special component features such as diode protection and shunt resistors in transistors. 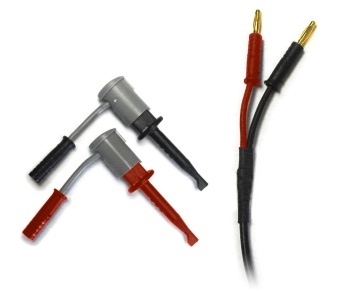 For two-leaded components such as diodes and LEDs, any pair of test clips can be applied to the component any way round, the Atlas DCA sorts it all out for you. There is no on/off switch, power is automatically turned on at the start of an analysis and then automatically turned off if inactive for more than 30 seconds. Each page of displayed information is presented in manageable amounts, with each page being displayed when you want it. If you want to concentrate on the "pinout" page then just select that page, you don't have to see information that you don't need. 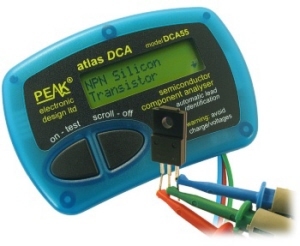 The Peak Atlas DCA is supplied complete with a long life battery, universal test probes and a comprehensive illustrated user guide. Automatically identify part type (eg, Transistor, JFET, IGBT, Regulator, Zener, Diodes, etc). •Automatically identify pinout (connect any way round). •Measure lots of component data. •Perform further detailed component analysis with the PC software included on the Peak USB flash drive. •Complete with premium gold plated hook probes. 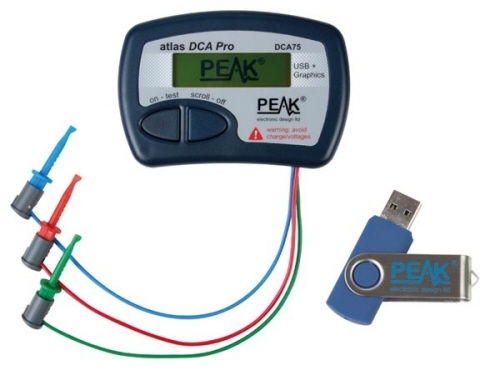 The DCA Pro is an advanced new design that features a graphics display, USB communications, PC Software and an enhanced component identification library. •Transistors (including Darlingtons and "digital" transistors), Silicon and Germanium types. Measures gain, VBE and leakage. •MOSFETs, enhancement mode and depletion mode types. Measure on-threshold (at 5mA) and approx transconductance (for span of 3mA-5mA). •JFETs, including normally off SiC types. Measures pinch-off voltage (at 1uA) and approx transconductance (for span of 3mA-5mA). •IGBTs (insulated gate bipolar transistors). Measures on-threshold (at 5mA). •LEDs and bicolour LEDs (2 lead and 3 lead types). •Zener Diodes with measurement of zener voltage up to 9V at 5mA. •Voltage regulators (measures regulation voltage <8V, drop-out voltage, quiescent current). Note that some regulators are not stable without their decoupling caps and/or minimum load and cannot be tested by the DCA75. •Triacs and Thyristors that require less than 10mA of gate current and holding current. 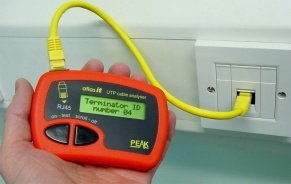 When connected to a PC using the supplied USB cable, a range of low current curve-tracing functions can be performed. Various graph types are available, with more to follow: •Bipolar transistor output characteristics, IC vs VCE. •Bipolar transistor gain characteristics, HFE vs VCE. •Bipolar transistor gain characteristics, HFE vs IC. •MOSFET and IGBT output function, ID vs VDS. •MOSFET and IGBT transfer function, ID vs VGS. •JFET output function, ID vs VDS. •JFET transfer function, ID vs VGS. •Voltage regulator, VOUT vs VIN. •Voltage regulator, IQ vs VIN. •PN junction I/V curves, forward and reverse options (for Zener diodes). Curve tracing is performed using test parameters in the range of +/-12V, +/-12mA. All curve-tracing data can be instantly pasted into Excel© for further graphing and analysis. PC Software is included with the DCA Pro on a Peak USB memory stick. Software designed for Windows XP, Vista, Windows 7 and Windows 8 (automatically runs in Desktop Mode). What's included? •DCA Pro instrument. •Micro USB cable (approx 1m). •PC Software on USB Flash Drive (512MB). •Premium gold plated hook probes. 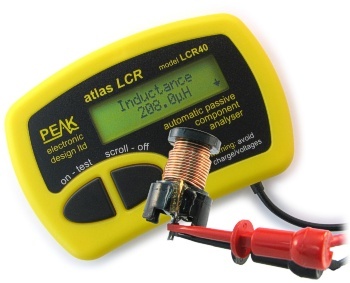 The Atlas LCR is an advanced instrument that greatly simplifies the testing of passive components. Traditional LCR bridges are inherently complex and very time consuming to use. The Atlas LCR does everything automatically, it tells you the component type in addition to component value data. What’s more, the Atlas LCR automatically selects the best signal level and frequency for the particular component under test. Just clip the universal test leads to your component and press the test button. In seconds, the Atlas LCR will identify the type of component (Inductor, Capacitor or Resistor) together with the component’s main value. 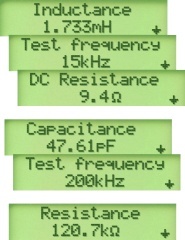 Additionally, further component data is also displayed, such as the DC resistance of an inductor. The test frequency is automatically selected to suit the component under test and this is also confirmed on the scrollable display. The Atlas LCR is supplied with our new detachable micro-hooks, allowing the use of the optional SMD Tweezers, clutch grabbers and gold plated crocodile probes. •Fluid measurements of L, C and R.
•Auto and Manual component type. •Auto and Manual test frequency. •Frequencies: DC, 1kHz, 15kHz and 200kHz. •Display of component values, complex impedance, complex admittance and magnitude/phase. The LCR45 is supplied with 2mm plugs and sockets with hook probes, user guide and GP23 Alkaline battery. The Atlas ESR PLUS is even better! This new model introduces new features including “Audible Alerts” and enhanced measurement range. Every measurement of ESR will be shown on the display as usual of course, but the unit will also produce a variety of tones depending on the value of ESR. And the tones themselves are surprising pleasant, including “Bell-like” pings (a couple of different types for ESR that is below certain values), and also a “Beep-Barp” type tone for ESR that is likely to be too high. There is also a reassuring “Blip” when the measurement has started and completed. The ESR measurement range has also been enhanced, now doubled, measuring from 0 to 40 ohms with a resolution as low as 0.01 ohms. This remarkably fine resolution is great for assessing large capacitors and even allows you to use the Atlas ESR+ for tracing short-circuits and finding the precise area of a PCB that has that invisible wisp of solder. Measuring a capacitor's ESR (equivalent series resistance) is a great indicator of capacitor condition. The Atlas ESR PLUS offers instant results, just connect the probes and press test. You can even use the Atlas ESR PLUS in-circuit, saving you the trouble of removing capacitors. When testing capacitors out-of-circuit, the unit will also display the capacitance. Traditionally, ESR can be a tricky thing to measure, which is a shame, it's a very useful diagnostic parameter. Of course, ESR meters are available from various sources, some are very famous in the repair sector, but the Atlas ESR PLUS is more than just another ESR meter. For a start, it's smart, both in looks and in brain. It can measure and compensate for the effects of measuring in-circuit, it also knows that you don't want to be hassled with capacitor polarity. It's designed with the real world in mind. 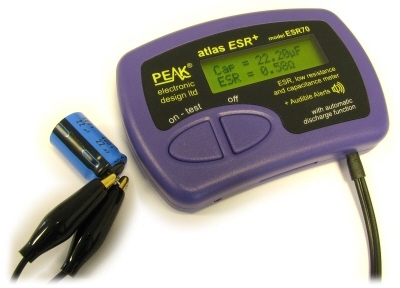 Some capacitors can be charged up, a lot, but the Atlas ESR PLUS doesn't mind. If your capacitor is charged, the unit will automatically carry out a controlled discharge procedure before measuring the capacitance and ESR. New enhanced dynamic range of 0.00 to 40.0 ohms. ESR Resolution as fine as 0.01 ohms! Supports capacitors from 1uF to 22,000uF. Capable of In-Circuit measurement of ESR. Polarity free, connect any way round. Protected against highly charged capacitors. Great for low DC resistance checking too (such as PCB short checking). Supplied complete with gold plated crocs. 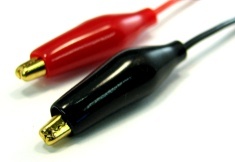 Test leads are ultra-durable and 30cm (12") long. Enhanced software compensation of cable resistance. Complete with comprehensive user guide. Tests at the industry standard 100kHz. Long life alkaline battery fitted. A totally unique instrument, offering fast and reliable analysis of most thyristor and triac devices. 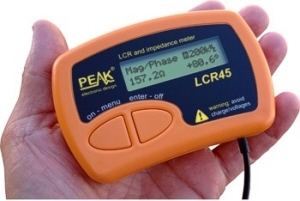 These devices often require test currents that are not available from existing test equipment. 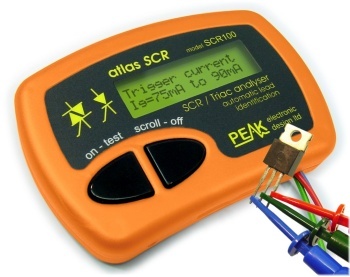 The Atlas SCR though can generate gate test currents from 100µA up to 90mA and load test currents up to 100mA to enable the safe and reliable testing of these tricky parts. Not only will the Atlas SCR generate the currents necessary to test most thyristors and triacs, it will also identify the type of part under test, identify all three leads and also categorise the gate sensitivity. Automatic identification of component type (Thyristor or Triac). Automatic lead identification (just connect any way round!). Categorisation of gate sensitivity (100µA, 500µA, 2.5mA, 10mA, 50mA, 75mA, 90mA). Load test conditions of 12V and 100mA (regardless of battery condition). Test pulse durations < 200µS minimises possibility of damage to sensitive parts. Fault identification (shorted junctions, faulty operation, etc). New 100% SMD construction ensures small size and great reliability. Clear and user-friendly scrollable display. Supplied with new Premium micro-hook probes. Accessories available include carry case and batteries. 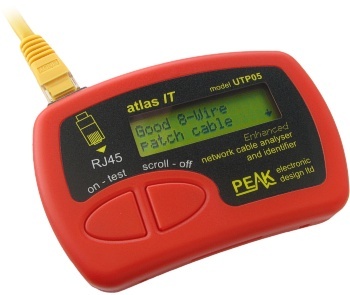 The Peak Atlas IT Network Cable Analyser has just got smarter, much smarter. The Atlas IT has always been a fabulous tool for identifying and analysing RJ45 based network cables, sockets and patch panels. Now this instrument features new intelligent software that can identify cable configurations even if there are faults in the cabling. It will even tell you the differences that it has detected between your faulty cable and the intended cable configuration. Simply connect one end of your network cable to the Atlas IT and the other end to the Atlas IT Terminator and press the test button. Within seconds, the Atlas IT will analyse the full connection pattern between one end of the cable and the other end. It then instantly identifies the cable type (based on the connection pattern) and displays this on it's easy-to-read green-mode display. The Atlas IT now features an enhanced cable library, enabling the intelligent identification of cable configuration, such as: "Straight-Through Patch Cables", "Crossover Cables", "Token Ring Cables", "Ethernet Economiser Adapters" and many more. If any problems in the cabling are detected, such as shorted, swapped or missing connections, then the Atlas IT will clearly identify these on it's display, showing exactly which connections require attention. Fitted battery and spare battery. 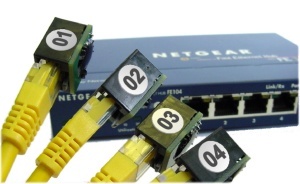 2 x 300mm Patch cables for socket and patch panel testing. Plastic full colour cable configuration charts for 8 most common cable configurations. Padded carry case with extra space for accessories. If you are not sure how to wire a certain type of network cable then the Atlas IT can be used as a quick reference guide too. Wiring instructions can be displayed on screen whenever you require and then the Atlas IT can be used to test the cable you have just made. Identification of many fault types including broken wires, shorted wires and swapped wired. Display of standard wiring colours. 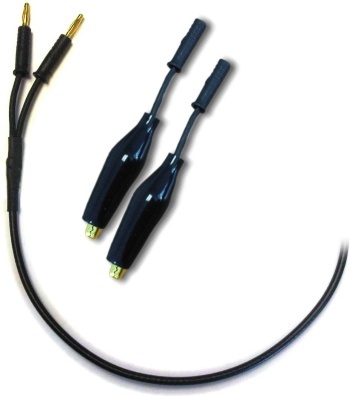 Compatible with optional identified terminators, great for multiple cable runs.